When you need to make a list, or quickly write down an idea, Sticky Notes is there. 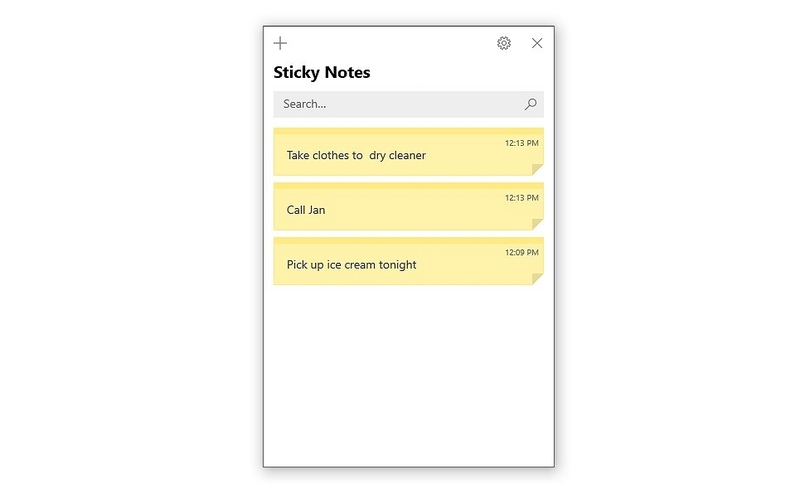 Sticky Notes allows you to create virtual reminders, make phone calls and map addresses right on your desktop. Let's learn how to make Sticky Notes work for you. Type Sticky Notes in the search box and select Open. You have three choices: New note creates a new Sticky Note, Notes list displays what Sticky Notes you’ve already created, and Settings provides you with options for customization. Select New note (+) and type or write anything from to-do lists, appointments, or whatever else you want to remember. Create an additional Sticky Note by selecting New note (+) again. The Notes list allows you to see all your Sticky Notes in one place. Select individual Sticky Notes from the Notes list to open or edit each one. Select Menu (…) from your Sticky Note to bring down a color menu. Choose the color you want by checking the box. Your Sticky Notes will appear in the new color you selected. Get to Settings anytime you have the app open by selecting the Settings icon in the Notes ist window. If the Notes list window isn’t open, you can reopen it by selecting the Menu (…) from a Sticky Note and go to Notes list. Access your notes across all your devices. To do that, go to Settings and under Sign-in to sync your notes to the cloud, select Sign in. You’ll be asked to log in to your Microsoft account. When you’re logged in, you can access your notes on your PC, phone and online. 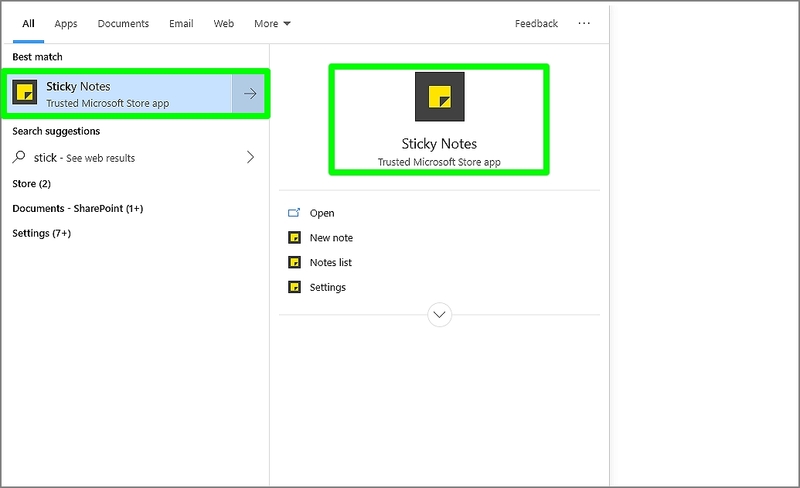 Insights in Sticky Notes uses Cortana to scan your typing for key terms —like dates, times, locations, or symbols—that could be turned into links or reminders. 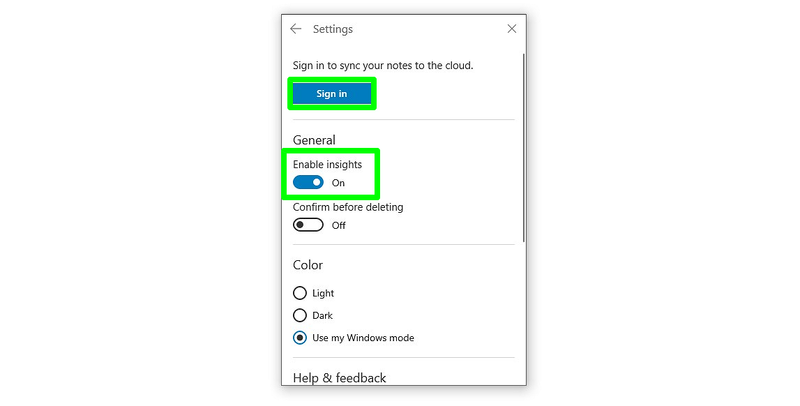 To turn on Insights, go to Settings and under Enable insights, switch the toggle key to On. 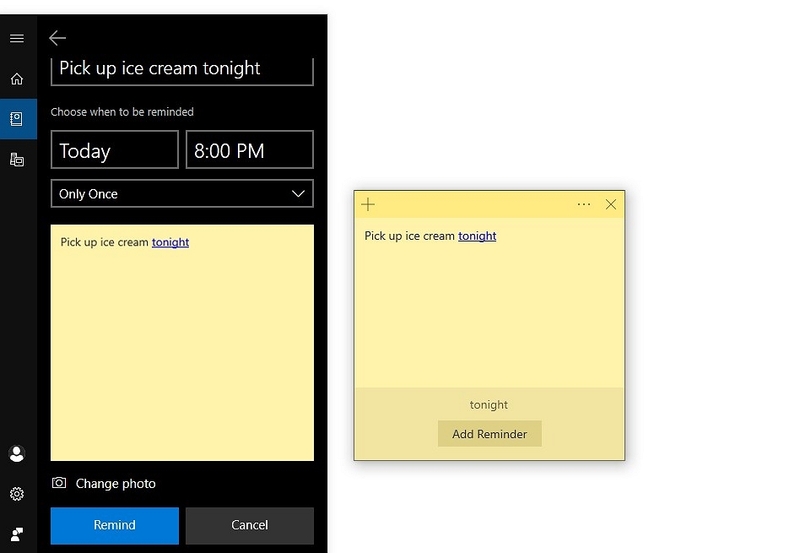 When you type a time or date into your Sticky Note, Cortana will automatically change your time or date to blue when insights is turned on and change your text to an active link. Select Add Reminder to open Cortana and enter the reminder date and time. Just like with times and dates, addresses can also be converted into active links. When selected, they will open Maps. You can save in Maps, get directions, or copy exact coordinates straight from Sticky Notes. You can capture and call phone numbers from Sticky Notes, too. To use the phone call feature, type the number you want to dial, and the app will create an active link for you to use. Select the link and choose the Call button. Sticky Notes will ask what application you’d like to use to make the call, and then it will dial the number for you. Make lists, set reminders, call friends, find locations with Sticky Notes. Sticky Notes allows you to get so much done, all without a single scrap of paper.